Access into the pool is easy with wide stairs. The dolphin is not real! 19% local fees and $1000 security deposit are not included. SPECIAL NOTES: Smoking allowed outside and on terraces only. No children under 10. No weddings or events. 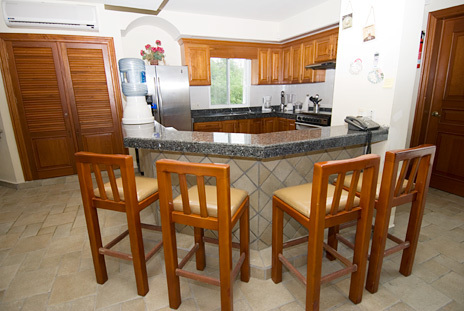 Villa Las Uvas is just across a quiet street from the beach. What makes Las Uvas special is that not only does it offer spectacular sea views, but it also has a big screen TV in the living room, a full size billiards table in the game room, plus a fitness room complete with a universal weight machine, an aerobic bicycle, and TV (free weights are for owner's use only). 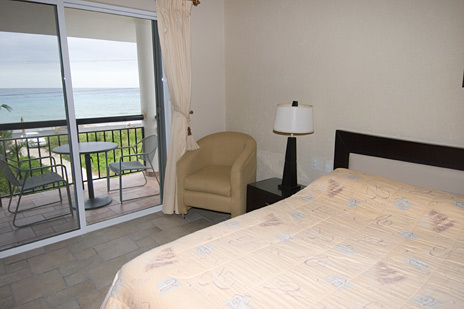 Villa Las Uvas is on the "old" beach front road. At one time this served as the main road. When the new highway was completed a few years ago, this old road was abandoned to all but local traffic. The beach directly in front of Villa Las Uvas offers some of the best snorkeling in Cozumel. 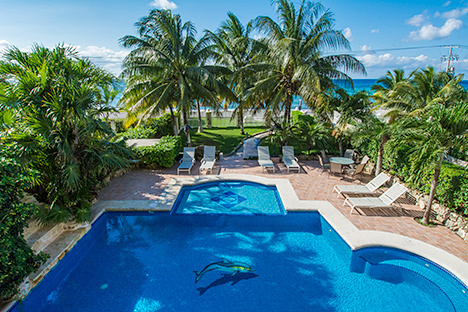 This deluxe stone masterpiece, offers the ultimate island experience. 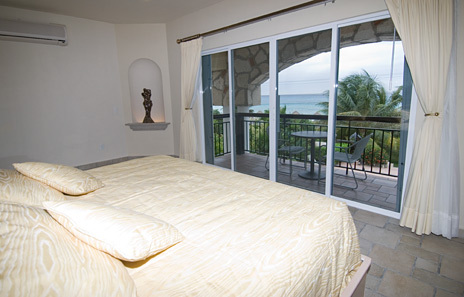 Count yourself as one of fortunate few able to sleep within sight and sound of the water. 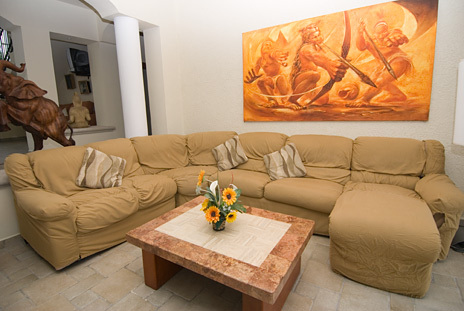 Villas Las Uvas is perfect for groups of family or friends; this vacation villa can accommodate up to 14 guests. 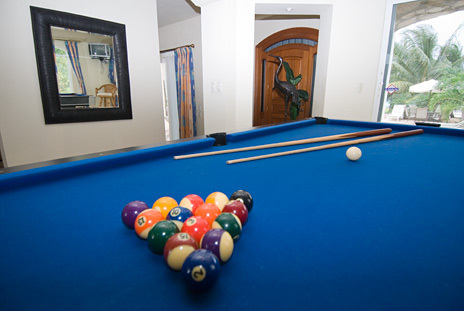 In the center of the house is a large gathering area, including pool table, large screen TV/Satellite/DVD, stereo, living room, and dining room. 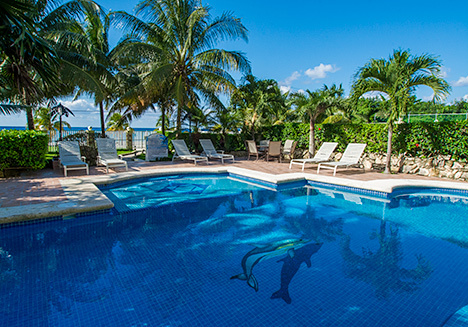 This vacation rental villa has it all. 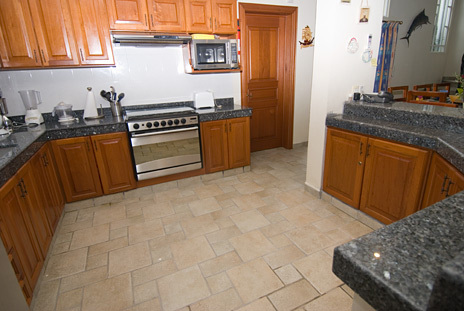 Vaulted ceilings, tile floors, full granite kitchen which is airy and open to the living area. 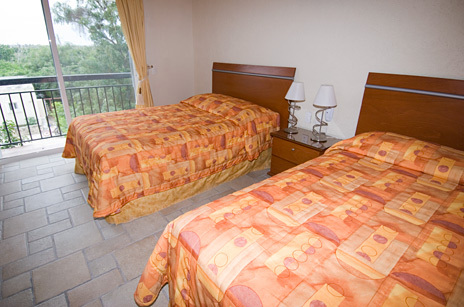 The 5th bedroom, downstairs shares a bathroom with the fitness room. 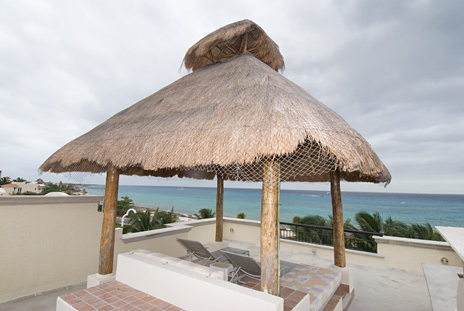 On the rooftop is a palapa covered patio area with cushioned sofas and hammocks. There is also a bathroom on this level. 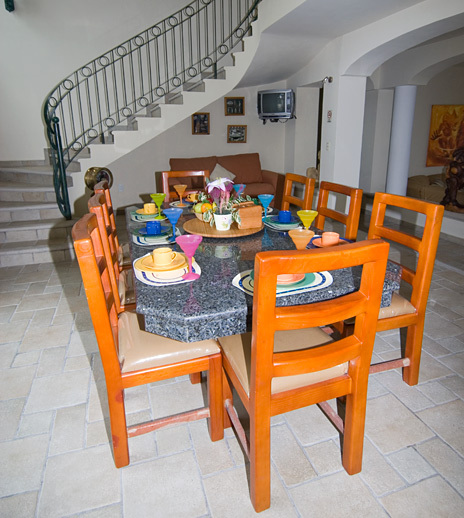 The Villa is 5 miles (ten minutes) to the town of San Miguel for a variety of restaurants, unique shopping, dive shops and complete grocery shopping. 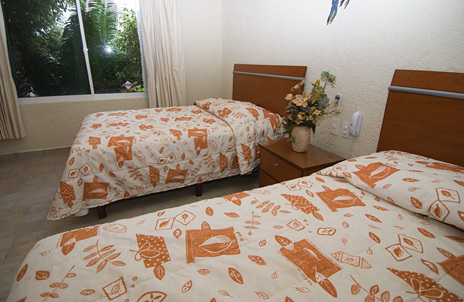 Plus there are a couple restaurants within walking distance of Villa Las Uvas. 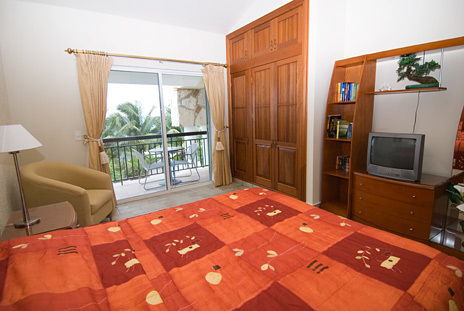 Villa Las Uvas is located between the Fiesta Americana Hotel and Chankanaab National Underwater Park. On the rooftop is a palapa with loungers and a cushioned sofa. 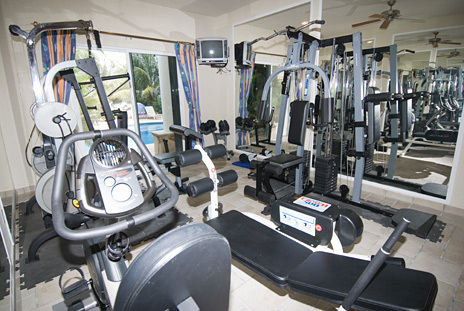 Keep up with your workouts in your own private gym!